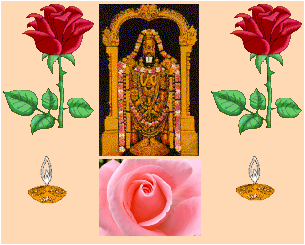 25.230 - Om AvartanAya namah. a) He whose nature rises above other things. b) He whose mind is turned away from worldly desires. c) He who is the AtmA of those who practice nivRtti dharma. d) He who is beyond the bonds of samsAra. This nAma occurs later as nAma-s 454, 604, and 780. This is another casewhere when the same nAma occurs more than once, the interpreters have givendifferent interpretations for each occurrence. It is a characteristic of acomposition of quality that there is no redundancy in expression of thoughts. tripAdUrdhva udait-purushah - The Purusha stands eminent in the parama-padawhich has thrice the glory of the material world" - purusha sUkta 4.
parAt-param yan-mahato mahAntam - He is greater than the greatest, moreexalted than the most exalted. - taitti. nArAyanIya 1.5.
b) parama vairAgya khyApanaAya vishayebhyah pratyAhRta-manAh nivRttAtmA - Toindicate His profound non-attachment to material objects, He has His mindwithdawan from them. About His meditation it is said - antarnivishTa bhAvam ca -He who has His thoughts concentrated on Himself. Also, Atma-dhyAna parAyaNAya -To Him who has His thoughts concentrated within Himself"; "hRd -admArpitamAnasam - Him with His mind fixed on the lotus-heart", etc. c) One who is the AtmA of those who practice the nivRtti dharma. (There aretwo kinds of dharma - the pravRtti dharma and the nivRtti dharma. pravRti dharmatakes us to the world of the pitR-s where we enjoy the fruits of our karma, andcome back to this world with the balance of karma-s to our credit; niv*ttidharma is that which leads one to moksha). SrI cinmayAnanda points out that in the example of the two birds sitting onthe same tree that is referred to in the munDakopanishad which has been referredto earlier in our write-up, the nivRttAtmA is the one who is looking on withouteating the fruits of the tree. The writer in dharma cakram points out that the significance of this nAma isto realize that we should live a life with detachment in material objects inorder to realize the Truth, and meditating on this nAma of mahA vishNu will helpus live that kind of life. Meditating on the Lord who has no attachments willlead us to live a life without attachment. He gives the life of Lord Rama as anexample of the life of nivRttAtmA. Some interpreters have identified the nAma itself as vimuktAtmA oranivRttAtmA in one or more of the occurrences of this nAma later. We will lookat the interpretations of these under the later occurrences. samvRtatvAt samvRtah. The root is vRn~j AvaraNe to cover. He remains hiddenfrom the unenlightened in whom the tamo-guNa dominates - tamsah parastAt. It isdevotion to Him alone that can reveal Him to us. The dharma cakram writer quotesnammAzhvAr's pASuram "mayarvaRa madi-nilam aruLinan evan avan" - (Weshould worship the One) who can bless us with the j~nAna and bhakti that canremove the ignorance, doubts, and viparIta j~nAnam - counter-productiveintellect?. Just as the sun creates the cloud which keeps the sun covered fromus, the a~jnAnam is covering us. Just as the sun's lustre is untouched by thecloud, His lustre is untouched by our a~jnAna. It is his dayA alone which canremove this a~jnAna, and it is devotion to Him alone that can help in this. The dispeller (of the darkness). The nirukti author summarizes SrI Bhattar's vyAkhyAna by the following words- tamaso vidyayA samyak mardanAt sampramardanah - He is sampramardana because Hedispels the enveloping darkness by the light of His knowledge. SrIaNNangarAcArya gives the meaning that He dispels the mAyA in His devotees. SrI Sankara interprets the nAma based on mardana - to destroy, and gives themeaning that He is sampramardana because of His act of destruction in the formsof rudra, yama, etc. - samyak pramardayati rudra-kAlAdyAbhih vibhUtibhih itisampramardanah (see the similarity to pradardanah earlier). Recall that SrIBhattar's interpretation is that mardana refers to destruction of the darknessor mAyA. SrI cinmayAnanda interprets mardana as referring to the act ofdestruction of the evil-minded and sensuous and extrovert - rAkshasa-s. The dharma cakram author interprets mardana in the context of the act ofbhagavAn in helping us to destroy the pride and aham-kAra in us and to unitewith Him. Life consists of destroying certain things and preserving certainthings. A good life is that where we understand what is to be preserved andpreserve those values, and destroy those that need to be destroyed. It is thusthat Lord rAma had His kodanDam when He went to the forest - to help preservethe Rshi-s and to help destroy the rAkshasa-s. Chanting the name of rAma wassufficient to turn vAlmIki from the ignorant person that he was to the greatsage vAlmIki. The nAma sampramardana should lead to understand the value ofdestroying the evil qualities in us and to develop the good qualities that willhelp us in realizing Him, which is naturally accomplished when we meditate onthe guNa of bhagavAn expressed by this nAma. The regulator of the day (time); The Sun. samyak ahnAm pravartanAt ahah-samvartakah - He who regulates well thesuccession of day and night. He is the cause for the revolution of the day andother divisions of time. The division of time into past, present, and futureprovides the knowledge of objects as old or young. It brings about theseparation or union of prakRti and purusha (Matter and Soul). It is also thecause of the six kinds of transmutations of prakRti (viz. birth, growth, change,existence, decay, and final death). Understand that I am the Light of the Sun that illumines all earth; and thetejas in the moon and fire are all mine only". The one who dynamises theday and gives life to all and lends energy to them to act, etc. is vishNu in theform of the Sun. The writer in dharma cakram points out that just as we can see an objectclose to us easily once there is light even though we can't locate it in theabsence of light, bhagavAn is the generator of light that helps us realize theknowledge of the Self, and in this sense also bhagavAn is ahah-samvartakah (thegenerator of day). Just as the Sun causes all beings to wake up when it rises,mahA-vishNu causes our desire to attain this knowledge of the Self to wake up inus. Just as the fall of the rays of the Sun causes the life forms to becomerejuvenated, the thought of vishNu rejuvenates the jIvAtmA in us and makes itshine. Just as the fall of the rays of the Sun on objects purifies them bydestroying the disease-causing germs etc., the thought of bhagavAn kills theevil thoughts in us and purifies our thoughts. So vishNu is the Sun for ourinner self just as He is the Sun for the external world. The Bearer or The Carrier; The Fire. The root from which this nAma is derived is vah - to carry. SrI Bhattarinterprets the nAma as referring to the act of bhagavAn in supporting theUniverse in the form of space. SrI aNNangarAcArya gives the meaning that He isthe bearer (supporter) of everyone. Vahni also refers to fire, since fire is thecarrier of the oblations offered in homa etc. SrI Sankara interprets the nAma inthis context - devebhyo havyam vaha nah prajAnan - One who, as fire, carries theoblations to the gods, or havir-vahanAt vahnih. a) The Giver of life-breath; The Air. b) One who needs no goading to Help His devotees. d) One who has no binding, unaffected by virtue and vice. e) One who is beyond dissolution. f) One who is omniscient - All-Knowing. g) Easily accessible to His devotees. h) One who has no fixed residence. i) One who is not supported (by Earth etc). k) One who is always awake. This nAma occurs again as nAma 818.
tadevAgnih tad-vAyuh - He is agni Himself and He is vAyu - (taittirIya AraN.10), supports the interpretation of this and the previous nAma-s as agni andvAyu respectively. ananAt - ujjIvanAt anilah - Bestows the life-breath on all. prAnAt vAyur_ajAyata - The wind was born out of His breath (purusha sUktam 14). In the occurrence of the nAma as nAma 818, SrI Bhattar derives the meaningbased on ila - to urge, and so the meaning given is - One who does not need tobe goaded by any one to serve His devotees. Ilati preraNam karoti iti ilah,tadrahitatvAt anilah - One who does not need a proposer or inducer.tadapyaprArthitam dhyAto dadAti madhusUdanah - When meditated upon, bhagavAnmadhusudana bestows His blessings on His devotee without the need for anyoneelse urging Him - vishNu dharma 74.42.
anilayah anilah (h) - One who has no fixed abode. na vidyate nilah nilayam sthAnam yasya. SrI rAdhAkRshNa SAstri adds that ila is Earth, and since He existed beforethe Earth existed, He is not supported by the Earth etc., and so He is anila (i).An alternate interpretation is na nilIyate iti anilah - He is Omnipresent,indestructible, in the form of anila - vAyu (j). Yet another interpretation is anAdAnAt anilah - One who has no binding (d). The dharma cakram writer gives us a view of how important the meditation onthis guNa of bhagavAn is for our life. Without food we can go on for many days;without water we can survive for a few days; but without air, but a few minutes.That is how important air is for our living; so is the meditation on vishNu forour spiritual life. He quotes mahAtmA gAndhi in this context - that he cansurvive without food for several days (and hasn't he proved it several times! ),but he cannot live without prayer for even a day. Another view presented relatesto arjuna's words to Lord kRshNa that mind wavers like wind and he can't get itunder control. BhagavAn, like vAyu, is spread everywhere, and it is difficult toget a grasp of Him just as we can't get the mind under control or keep the airstatic in one place without a sealed container. But just as man has learned tocontrol and contain air, he can learn to control his mind by constant meditationon vishNu. The uncontrolled mind is like a storm, and it can be trained to becalm by meditation on vishNu. SrI satyadevo vAsishTha gives the interpretation starting from ila - tosleep. Thus one meaning given is One who never sleeps, or One who is alwaysawake - jAgRvim vibhum - Rg veda. This is reflected in His forms as the Sun, therest of the planets, the oceans, the wind, etc. In addition to thisinterpretation he also gives the interpretations a) and h). I was amazed to find that this seemingly simple nAma of two syllables hasthis many interpretations. The bearer of the Earth. SrI rAdhAkRshNa SAstri gives references to several other nAma-s which expressthe above idea - mahI-bhartA (184), mahI-dharah (319, 371), triloka-dhRt (757),dharA-dharah (762). In addition, some vyAkhyAna-kartA-s have interpreted nAma240 (which we will cover next week) as viSva-dhRk - One who rules over theworlds, similar in purport to the current nAma. The writer in dharma cakram brings the significance of this nAma to a levelof understanding that is easier to comprehend. When we say bhagavAn is thebearer of the Earth, what we mean is that directly or indirectly He issupporting all the life forms by providing food and shelter to all, irrespectiveof whether we are devoted to Him or not, all the good and the bad. Either wesurvive by drawing on the vegetables and other food that we directly get fromthe earth, or some beings survive by preying on other life forms which in turnlive by drawing on the direct produce from the earth. So this nAma signifiesthat He supports us physically in the form of the earth, and also sustains usall through the food from the earth. SrI satyadevo vAsishTha adds that a mother bears and protects the children,the husband protects the wife, and He protects everyone, and so thedharaNi-dharatva guNa of bhagavAn is all around us.